This is the unlawful taking of motor vehicle contents or parts. Car prowls are crimes of opportunity. 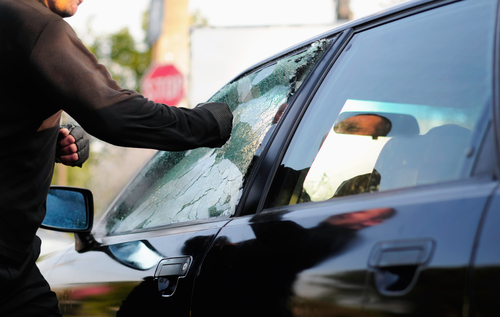 An offender makes a split second decision to break into a vehicle based on a perception that there are items of value in that vehicle, which makes the potential payoff worth the risk. Car prowl is consistently one of the top three reported crimes in Salisbury during the last five years. Although there is no profile of a typical car prowler, a number of offenders break into vehicles to support drug addictions. One offender broke into 15-20 vehicles per day at the height of his affliction. A car prowl can be completed in a minute or less, and a significant number of these crimes occur between the hours of 10:00 pm to 4:00 am. Methods of entry include: entering into the vehicle through an unlocked door, breaking a window, or using a wedge to gain access. The offender often wears a backpack or bag to transport stolen items. Items frequently stolen include GPS systems, laptops, electronic devices, CDs, mail, bills, documents with personal information, purses, wallets, luggage, gym bags, money, cell phones, insurance cards, vehicle registration, and shopping bags. Steps to Car Prowl Prevention Car prowl is one of the easiest crimes to prevent with increased awareness and a change in habits. The following steps will reduce the chances that your vehicle will be targeted: • Keep the interior of your car “showroom” clean. Never leave valuables, including bags, purses, wallets, briefcases, laptops, cell phones, loose change, or anything that may appear valuable to a thief in plain view. Offenders have broken in to vehicles for items such gym bags because they assumed there were electronic devices and other items stored in them. • Hide chargers and accessories that indicate a GPS, mobile phone, or other device may be stashed in your vehicle. • Remove garage door openers, key cards, and house or work keys from the car so that a prowler cannot gain access to your home. • Don’t store or leave credit cards, identification or personal information in your glove box or anywhere in your car. Car prowls are a gateway to other crime like: • Identity Theft • Burglaries • Vehicle Theft What to Do if Your Car is Broken Into If your car is broken into, report the crime to the police. If it’s a crime in progress, call 9-1-1. Take note of any details of the suspect(s), vehicles, and or activities, and share your observations with the police. If the crime already occurred, contact the police non-emergency number at 410-548-3165 if there is NO known suspect. If the thief is caught and arrested, call the District Attorney’s Office at 410-548-4880 to pursue charges against the individual(s). Report suspicious activity to the police as it is occurring. If it’s not a crime in progress, you can call the police non-emergency line at 410-548-3165. Encourage your neighbors to keep an eye out for any suspicious activity. One car prowler stated that if a neighborhood consistently kept their vehicles free of valuables, he would move on to another neighborhood. Please let your neighbors know when there are car prowlers in your neighborhood and what they can do about it. A good way to share the information with neighbors is through your Neighborhood Watch or Community Affairs at the Salisbury Police Department. • If you have to leave valuables in your car, put them in the trunk before you arrive at your destination. • Before leaving your car, always remove the keys, roll up the windows, lock the doors, and set the alarm (if you have one). • If possible, store your car in a closed and locked garage. If your car is parked in a carport or near your house, leave your exterior lights on throughout the night. • Consider replacing the light fixture closest to your car with a motion detector unit. Motion detectors are good psychological deterrents, causing the thief to think that someone has seen them when the light comes on. Additionally, the light makes the prowler or thief more visible. • Improve visibility where your car is parked. If you park on the street, choose a well-lighted, open space even if it means adding additional exterior lighting. Trim back trees or bushes that block the view of your vehicle from your home. Avoid parking near anything that limits visibility like dumpsters, large vans or trucks, or wooded areas. • Use a mechanical locking device such as a club that locks to the steering wheel, column, or brake. • Keep your keys with you instead of putting them in a hiding place. • Don’t leave your vehicle in unattended parking lots for long periods of time. • When you pay to park in a lot or garage, leave just the ignition key with the attendant. Make sure no personal information is attached. Do the same when you take your car in for repairs. • Carry the registration and insurance card with you when you leave your vehicle. NOTE: Make sure you have these items with you when you return. Operating the vehicle without these documents is against the law. • Consider installing a security system if you live in a high-theft area or drive an automobile that is an attractive target for thieves. You may get a discount on your auto insurance. • Organize a Neighborhood Watch. Get to know your neighbors; share contact information – phone numbers, emails – and look out for each other. The people who live on your block are the most likely to recognize suspicious people or suspicious activity. • Be observant when you exit or enter your parked vehicle, stop and take a look around the area. • Report any suspicious activity to the police.